Named for the giant Saguaro Cactus which are unique to the Sonoran Desert, Saguaro National Park protects a unique landscape of desert scrub and grassland surrounding the city of Tucson, Arizona. 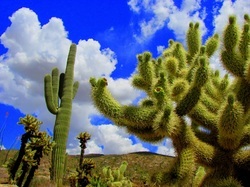 Saguaro National Park is separated into two districts surrounding Tucson, Arizona. The Rincon Mountain District is located east of the city and the Tucson Mountain District is located outside northwest of Tucson. The park is open year-round. High temperatures from May through September often exceed 100 degree Fahrenheit. October through April, visitors can experience cooler highs in the 60s to 70s with temperatures dropping below freezing occasionally overnight. Hiking is popular in the park with more than 165 miles of hiking trails throughout the park. Hiking loops such as the Mica View Loop offers a quick look at the cactus landscape while longer hikes, such as the 5.6-mile Garwood Loop, travel into the foothills of the Rincon Moutains and offer great views of the Catalina Mountains. In the Tucson Mountain District, the Signal Hill Petroglyphs Trail offers a glimpse of history while the Hugh Norris Trail offers the longest hike in the western district at 4.9 miles one-way to the top of Wasson Peak. Six campgrounds, ranging in elevation from 4,800 feet to 8,000 feet above sea level, are located throughout the park. Park rangers in Saguaro National Park offers several guided interpretive programs throughout both areas of the park. Join park rangers on guided morning hikes, moonlight hikes, or illustrated talks on the park’s flora and fauna. Program schedules change throughout the year. For younger patrons, the Junior Ranger Program can learn about the desert environment through various activities and programs. Having adapted to the high temperatures and lack of water, several animals call the park home. Jackrabbits, horned lizards and Gila monsters are frequently encountered. Bobcats, mountain lions and black bears thrive in the park as well, so visitors should always be aware. The Gila woodpecker, elf owl, Anna’s hummingbird, Harris’s hawk, roadrunner and many other birds make birdwatching in Saguaro National Park very popular and rewarding. Of course, the park gets its name from the giant saguaro cactus (Carnegiea gigantea) that stand as silhouettes against the desert sky. The lifespan of a saguaro is about 150 to 175 years. These cacti can grow as tall as 50 feet and may weigh more than six tons. The cacti bloom from late April through early June, opening their flowers in the night and closing them during the high daytime temperatures. In 1933, Saguaro National Park became the first U.S. national park unit established to protect a species of plant. President John F. Kennedy expanded the land in 1961 and Congress designated 71,400 acres as wilderness lands in 1976. In October of 1994, President Bill Clinton enlarged the park boundaries once more to create America’s 52nd national park. Click to see a detailed Saguaro National Park map.